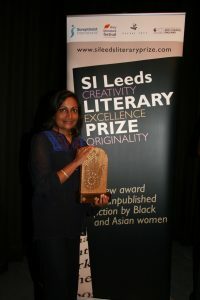 We answer some of your Frequently Asked Questions about the SI Leeds Literary Prize. Q: Why does the Prize exist? A: The Prize exists to act as a loudspeaker for Black and Asian women’s voices, enabling fresh and original literary voices from a group disproportionately under-represented in mainstream literary culture to reach new audiences. In addition to providing a platform for these new voices, a key part of the Prize’s ethos is to support our shortlisted writers through a package of speaking events, network development, training and mentoring to enable them to fulfil their potential. Q: Who is the Prize for? A: The Prize is Leeds-based but national in its remit, and is for Black and Asian women writers aged 18 or over who are resident in the UK. Unusually, it is a prize for unpublished fiction, which makes it distinct from many other literary prizes for which only published works are eligible. The Prize’s focus on unpublished fiction means that, importantly, it encourages the broadest range of entries, separate from publishing trends or expectations about the sorts of book that our eligible writers might choose to write. Q: Why is the Prize only for Black and Asian women? A: Women writers of Black & Asian backgrounds are disproportionately under-represented in bestseller lists and in the writing industry – a disadvantage linked to their minority status. In 2010 not a single writer defined as Black or Asian entered the Nielsen Bookdata bestseller list. Over ten years of records we identified only 4 Black and Asian women writers who reside in the UK, and 14 overall. We believe the Prize is justifiable under the terms of Positive Action in the 2010 Equality Act, on the basis that: Black and Asian women writers suffer a disadvantage linked to their race and gender, and have a disproportionately low level of participation in the UK writing industry, the action we are taking encourages this group to overcome this disadvantage and encourages participation and the prize is a proportionate response to the issue. Q: Is the Prize only open to Yorkshire BAME women? A: No – SI Leeds Literary Prize is a national award, although we are very proud of our Yorkshire roots and connections. Entrants must be UK-based. Q: How much is the Prize? A: The writer of the winning entry in 2018 was awarded the 1st Prize Aspire-igen award of £3,000 plus a host of additional valuable benefits through the Prize’s unique Prize Plus writer development scheme, including a free place at an Arvon creative writing course; free manuscript assessment of their work from The Literary Consultancy; invitation to New Writing North’s London summer salon event for publishers and agents; workshops and support; speaking engagements, including at Ilkley Literature Festival 2018 and serious consideration for publication by Peepal Tree Press. Q: What has happened to previous winners? A: Minoli Salgado’s A Little Dust on the Eyes, about Sri Lanka’s twin tragedies of a brutal civil war and the Boxing Day tsunami, won the 2012 Prize and was published by Peepal Tree Press. A Little Dust on the Eyes is now one of Peepal Tree Press’s best-selling novels and has recently been translated into Slovene, and longlisted for the prestigious 2016 DSC Prize for South Asian Literature. Runner-up from 2012, Karen Onojaife, was of the judging panel for the 2016 Prize and her Starling won 2nd prize in the Mslexia Short Story Competition 2013. Our 2014 winner, Mahsuda Snaith, went on to win the 2014 Bristol Short Story Prize and has signed a two-book deal with Transworld. Her winning entry has now been published as The Things We Thought We Knew. 2014 Readers’ Choice winner Kit de Waal has gone on to sign a three-book deal with Penguin. The first of these novels, My Name is Leon, was published by Viking to significant critical acclaim, and her follow-up novel, The Trick to Time, was longlisted for the 2018 Women’s Prize for Fiction. Our 2016 winner, Amita Murray, has signed a two-book deal with Harper Collins, and her debut novel, Finding Rose, is due for publication in 2019. Winnie M Li, 2016 runner-up with Dark Chapter, has won The Guardian’s Not The Booker Prize for her entry in 2017. Stella Ahmadou’s shortlisted entry from 2016, Deadly Sacrifice, will be published by Jacaranda Books in 2020. Q: When is the closing date? A: The Prize is biennial and the next edition is scheduled to take place in 2020. Please watch this space for more details but we expect to launch the Prize at the 2019 Ilkley Literature Festival, and to be accepting entries from 1 January 2020. Q: Where will the Prize giving take place? A: The Prize award ceremony will be in October 2020, as part of Ilkley Literature Festival. In addition, our 2020 shortlist will be given additional speaking opportunities at agreed partner events around the country. Q: I’m a published writer – am I still eligible to enter the prize? A: Yes – published and unpublished writers are eligible, so long as the manuscript submitted has not been published. Q: My manuscript has been published online – does this count as being published? A: If your work is available online free of charge, this is eligible for submission to the prize. Manuscripts currently available for sale online, either in full or significant proportion (i.e. more than 50% of the total manuscript) are ineligible – sorry. Q: I have written more than 30,000 words but my book is not yet finished. Do I have to submit the full manuscript? A: Yes – the prize is only open to complete and finished manuscripts. The deadline for submissions is 30 April 2018. Q: Is work which has been translated from English and published in another language, but which has not been published in English, eligible for entry? A: Yes, work translated from English and published in another language, but which has not yet been published in English, is eligible for entry, provided that it meets the stated criteria for originality – i.e that the work in English is the author’s own original work. Q: I am a UK based woman but I am not sure if I am eligible to enter because of my ethnicity. Can you help? A: The prize is open to a broad range of ethnicities, as self-defined by entrants. See here for more details. Q: I entered a manuscript for a previous edition of the Prize – is it eligible for re-entry in the next edition? A: Yes, you can enter the same manuscript again if you wish. You can also submit more than one entry, but each entry will cost the same entry fee.